KWA produce amazing pistols and rifles. Rugged designs, textured materials, and metallic surfaces completely make up for the proprietary internals issue. After all, if an airsoft gun has everything you need from the start, why would you want to tweak around with its internals? The KWA brand is great for various stock weapons, but keep in mind that they feature a specific (to be read as proprietary) type of internals. Proprietary means you don’t have too much freedom when it comes to customizations, repairs, and upgrades. Still, KWA came a long way and, even though they still sell guns with a proprietary gearbox, they also offer the necessary parts for upgrades and repairs. Moreover, KWA guns are used by a wide range of players starting with beginners and ending with military and law enforcement agencies. They are well-known in the market for pushing the limits of airsoft technology and advancement while other brands are more concerned with the external aspect of their products. For instance, their NS2 Gas Blowback System and the 2GX Mechbox are designed to increase performance and reliability beyond the conventional standards. The guns produced by KWA are considered to be durable in time, comfortable to use, and accurate even after some serious wear and tear. 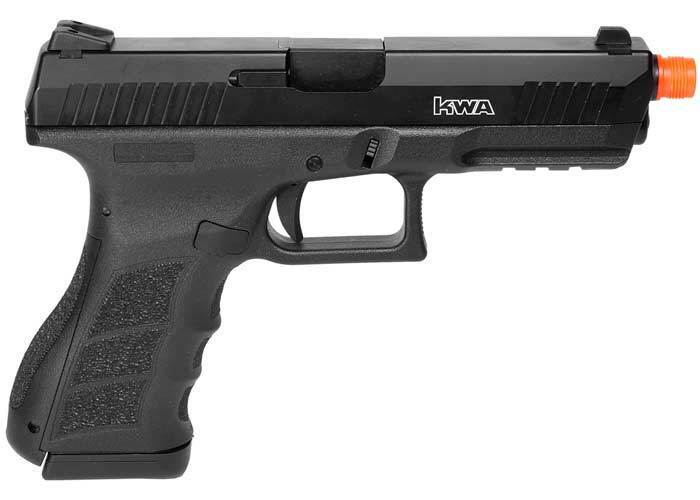 KWA is well0known for their GBB rifles, pistols (LE/military and 1911 series), and SMGs. They also create training weapons that are not destined for the standard airsoft field. As usual, the price differs from one type of airsoft gun to another, but most KWA products sell in between $120 and $400+. Overall, this is not the cheapest brand. Now that we’ve talked a bit about the brand, let’s have a look at some of their specific products. The ones listed below I found to be the most popular, but of course, preferences can vary. Still, they can give you a nice view of the type of airsoft weapons to expect from this brand. Equipped with NS2 Gas Delivery System, this Adaptive Training Pistol (ATP) is a semiautomatic design developed in collaboration with law enforcement and military agencies. Since it was created to help mimic real-life battle situations, the recoil is crisp and powerful, while the build is highly realistic. The combination between the full metal slide and polymer body gives the pistol a realistic weight and feel. Moreover, there is an adjustable hop-up unit that allows players to adjust long-distance shots for increased accuracy. Not to mention, the rail underneath the barrel makes a great place for various accessories. The pistol shoots at about 320 – 350 FPS, it has a 23 rounds magazine and comes with interchangeable back straps (for increased comfort). 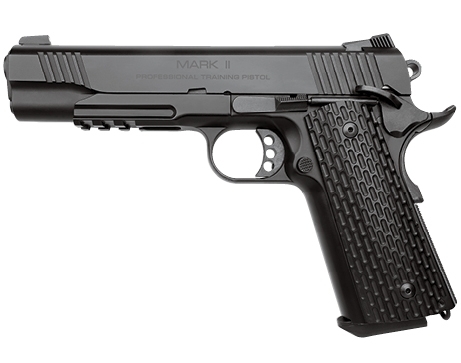 This 1911 pistol is representative for the level of quality when it comes to GBB pistols. Fitted with the NS2 system (for close-to-reality blowback action), the pistol is powerful (350 FPS with .20 BBs) and accurate. Moreover, the M1911 MK II is designed for training situations, meaning the producer didn’t use the regular standards of quality. As a result, the pistol feels rugged and realistically heavy in your hands. Moreover, the hop-up unit allows the player to make adjustments for various shooting ranges. In terms of design, the pistol is stylish, and the skeletonized trigger and hammer make it more interesting. You’ll also enjoy the tactical rail underneath the barrel since it allows for several cool accessories. With a powerful blowback action (due to the NS2 system), the M9 tactical PTP pistol is perfect for both field action and training. 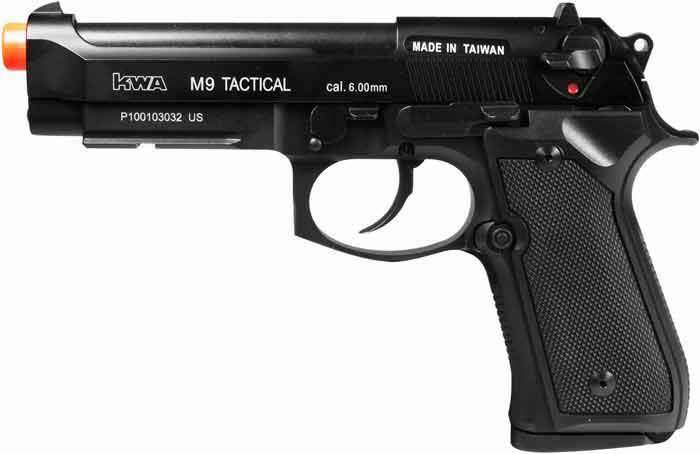 The M9 from KWA is accurate (due to the adjustable hop-up unit), powerful (up to 350 FPS) and sounds like a real gun. I like that it features a combination of metal and polymer body that is perfectly balanced to feel like its real steel counterpart. Moreover, it has ambidextrous safety and hammer decock systems and Picatinny rails for accessories. The magazine holds up to 25 rounds and there are front and rear iron sights to make sure this semi-auto pistol can be used by any type of player. Overall, it’s a nice sidearm (it fits most holsters) that works great in the field or for training. The AKR-74M is one of the newest AEG models from KWA, and players love it due to its realistic recoil obtained with the help of the Kinetic Feedback System. This way, even though you’re not shooting a GBB airsoft weapon, you can still properly enjoy it. True to their mission, KWA also fitted this rifle with Switch Life Extender, which is a system designed to minimize trigger damage from wear and tear. Moreover, the gun has customization possibilities due to the quick-change spring system. It also comes with an adjustable hop-up unit and adjustable front and rear iron sights, for increased accuracy without the help of optics. The design features a polymer folding stock with a metallic alloy body and polymer grip and handguard. As a result, the rifle feels heavy in your hands, just like a real-steel design would. The rifle is also powerful (420 FPS) and can use a 30 or a 60 rounds magazine. The battery (11.1v LiPo) is housed in the side-folding buttstock and you can install an optic side mount. 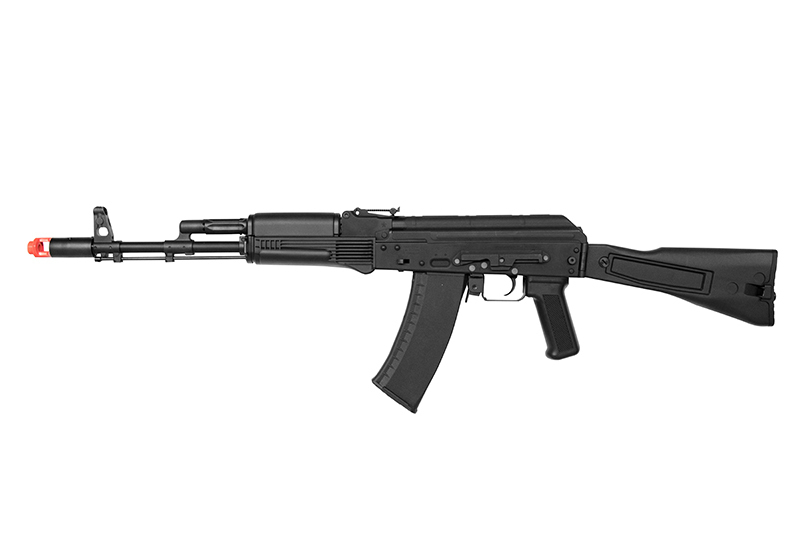 Moreover, the AKR-74M is designed with a mechanical cut-off switch which is activated when the magazine is empty. This is an AR 15 style GBB rifle designed for professional training and approved by the ATF. The rifle is equipped with an aluminum alloy receiver that houses a steel reinforced bolt carrier (that sends realistic feedback to your shoulder). Moreover, this rifle can be customized using AR 15 pistol grips and trigger guards. It is also equipped with a new and improved hop-up system that makes range performance better. Thus, the rifle can shoot at about 380PFS in 75 degrees Fahrenheit weather (the main propellant is green gas). The magazine holds up to 40 rounds, which fits well with the 13+ RPS rate of fire. I also like that the rifle can be used in both semi and full auto fire modes, which makes it perfect for CQB situations. Not to mention, the 6-position collapsible stock and adjustable front and rear sights! Most KWA fans know about their Ronin M-Series, and the RM4 is dubbed to be one of the most modern designs of the series. With a modular design, the RM4 Ronin works with both the 2.5 and 3 AEG gearboxes from KWA which allows players to customize the internals as needed. Furthermore, the internals also provide this rifle with plenty of power (410 FPS) and a realistic recoil (due to the Kinetic Feedback System). On the outside, the RM4 Ronin is gorgeous, due to the MLOK-compatible rail that allows players to add accessories as needed. You’ll also enjoy the electrical cut-off system that stops the guns from firing when the mag is empty. The brand is also known for producing several badass submachine guns, but I’ll only talk about one since the others are somewhat similar in design with slightly different internals. If you’re looking to impress your team, this is the airsoft weapon to have! Equipped with the legendary KWA NS2 GBB system, the submachine has a lot of attitude, so I wouldn’t recommend it to a beginner. Airsoft players love its rapid rate of fire, amazing reliability in the toughest conditions, and power (380 FPS with .20g BBs). Since it’s a submachine gun, it supports both semi and fully automatic firing modes, but the magazine is a bit small (only 48 rounds). Finally, I enjoy the folding stock (ideal for CQB situations) and the Picatinny rail system that allows you to mount all sorts of accessories. As I already mentioned, KWA also produces parts, so players are not too limited when it comes to upgrades. They mostly produce magazines and parts for various gas magazines (such as valves and other pieces that are susceptible to wear and tear). You’ll also find parts for bolt assemblies, BBs, and some interesting carbine kits.